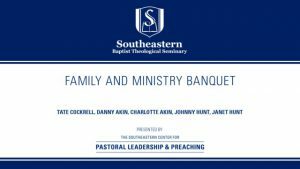 The Center for Pastoral Leadership & Preaching hosts a panel discussion about marriage, children, and ministry with Johnny and Janet Hunt of First Baptist Woodstock, Georgia and President Danny Akin and his wife Charlotte. 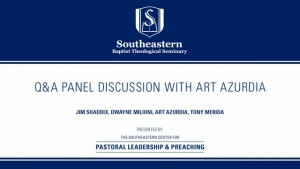 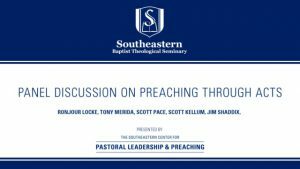 Jim Shaddix, Dwayne Milioni, Art Azurdia, and Tony Merida sit down to discuss preaching during a Facebook Live Q&A Session. 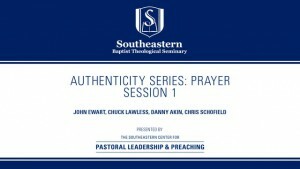 John Ewart, Chuck Lawless, Danny Akin, and Chris Schofield come together in this Authenticity Series event to discuss Prayer and how it strengthens the local body of believers. 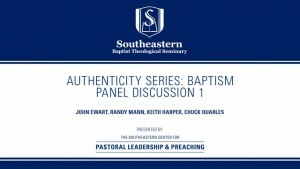 John Ewart, Randy Mann, Keith Harper, and Chuck Quarles talk about the practicalities involved in baptism.